Yesterday it was almost like Spring outside. Today was a different story. We had another Nor'easter here in Boston and the snow came down like crazy. While the babies took their morning nap, Lila and I went out to play (don't worry, Johnny was inside studying). 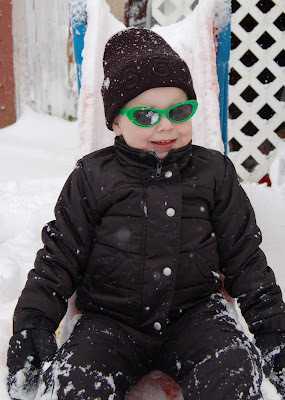 When we stepped outside she got upset that the snow was blowing in her eyes but some sweet green shades did the trick! Looks like a lot of fun! I was going to take Kay outside during Aubrey's nap, but Brian ended up going into the office today. Love the green shades, they are very hip! What a fun day! I mean seriously...what's better than green sunglasses? Love the glasses, heheeh, hope u guys keep the fire stocked high. Looks like so much fun! 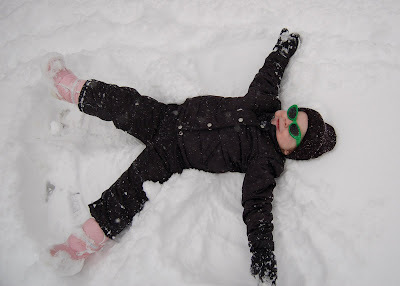 I am missing the snow after looking at your pics. 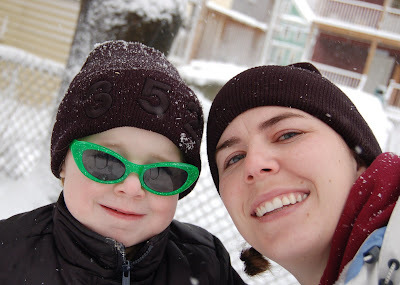 wish you guys could have played in the snow with us(Amy, me and the kids)in Toronto. We borrowed some sleds and it was awesome! There have been quite a few days when sunglasses would have been very helpful. Maybe my kids would have stayed out longer than 5 minutes when the wind and snow is hitting them in the face! I am loving the pictures. Looks like a lot of fun!! Em, You are such a great mom! I love your poster idea, with the quotes! You and Lila look so cute! I miss you guys.